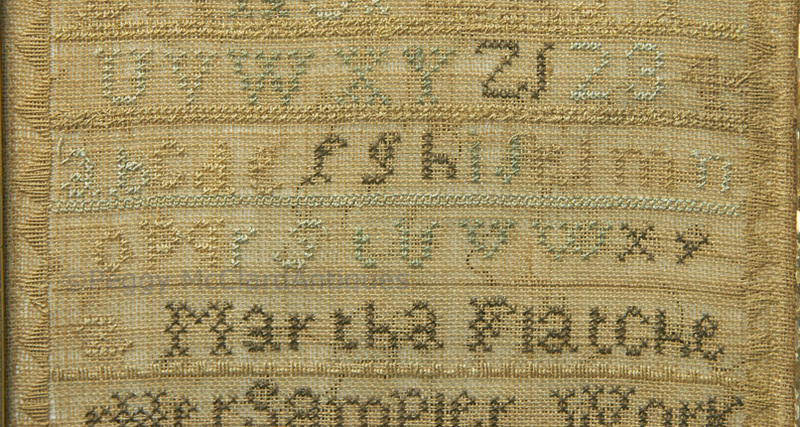 1834 Sampler worked by a 10 year old Martha Flatcher. 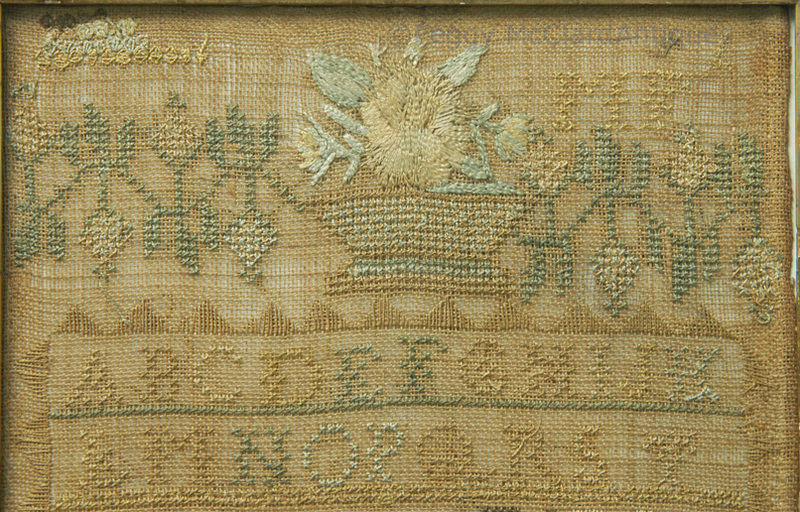 This long, narrow sampler has two alphabets (all caps and all small), a few numbers, sentiment, potted flower tree, parents’ names, and initials at the bottom. It is silk thread over loosely woven linen worked in colors of green, gold, tan, blue and black. 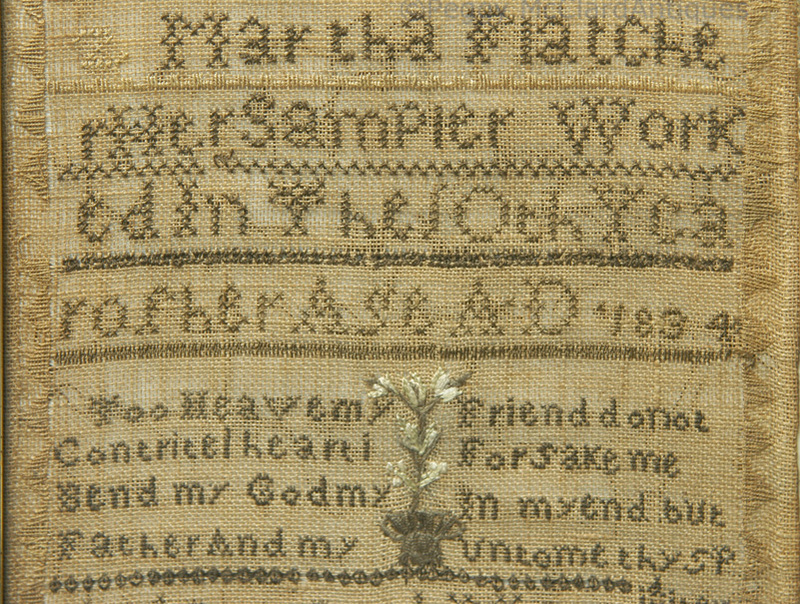 Martha used a variety of embroidery stitches including cross-stitch, buttonhole stitch, satin stitch, something like an Irish stitch and others that I can’t identify. I also have no idea of the meaning of the letters below Martha’s parents’ names or who Susan Albert might be. The upper left corner has the start of a border with queen's stitch but appears to have been abandoned….if it had been finished it would have run into the potted flower at the top center (worked in satin stitch). 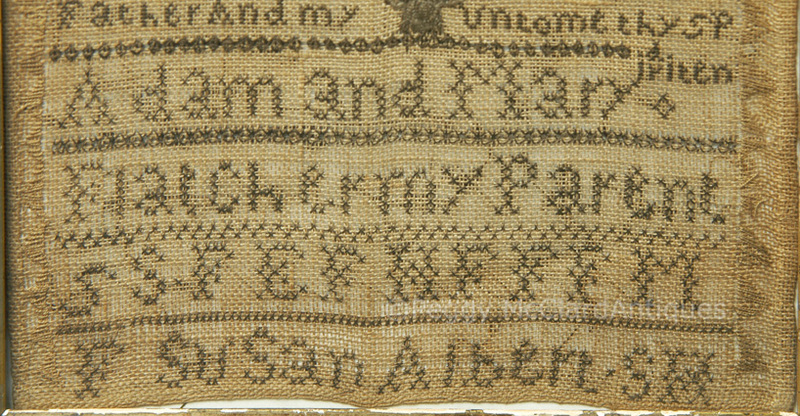 It is obvious that Martha had a bit of trouble with spacing and the way these young girls broke or ran together names and words is what I think I find most charming about these schoolgirl embroidery pieces. I can’t even imagine stitching such a sampler at 10 years old! The sampler is housed in period gilt frame which probably started life as thick liner for a bigger frame. The framed size is 18 ¼” x 9 3/8”. The frame has a few bumps as you can see in the photos, but the sampler is very good condition with some fading to lighter colors of thread. It is conservation mounted and the back is covered with brown paper on which 3 labels were transferred from another frame. 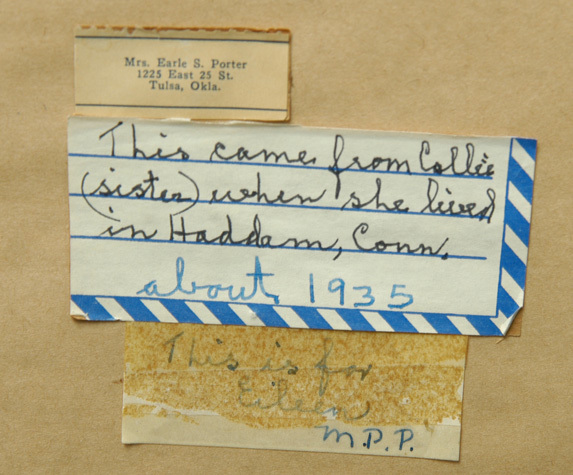 The first label is a mailing return label which reads, "Mrs. Earl S. Porter / 1225 East 25 St. / Tulsa, Okla.". The second is a handwritten label saying, "This came from Callie / (sister) when she lived in Haddam, Conn" on same label (which looks like part of old shipping label or jelly label "about 1935". The last handwritten label says "This is for / Eileen / M.P.P."